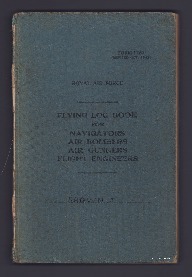 Flying log book for navigators, air bombers, air gunners, flight engineers for Jeff Brown, air gunner, covering the period from 18 August 1944 to 31 December 1951. Detailing his flying training, operations flown and post war flying. He was stationed at RAF Dalcross, RAF Oakley, RAF Westcott, RAF Bottesford, RAF Fiskerton, RAF Wellesbourne Mountford, RAF Marham and RAF Coningsby. Aircraft flown in were, Anson, Martinet, Wellington, Lancaster, B-29, Oxford and Tiger Moth. He flew 5 Operation Manna sorties to Rotterdam and Hague, and one Operation Exodus to Brussels with 576 squadron. Post war flying was with 149 squadron. Great Britain. Royal Air Force, “Jeff Brown's flying log book for navigators, air bombers, air gunners, flight engineers,” IBCC Digital Archive, accessed April 24, 2019, https://ibccdigitalarchive.lincoln.ac.uk/omeka/collections/document/16230.